A room full of science bloggers fell silent after Liz Neeley (compassblogs.org) asked how much effort they invested in headlines for their blog posts. Apparently most of the public in the room, including myself, doesn’t fuss a lot about headlines. Seasoned blogger Brendan DeMelle (DeSmogBlog.com) told us that this inattention may cost your post a lot of its potential audience. Most viewers/readers will only read your headline. You have a few seconds of their attention, then they are gone, adios, sayonara, arrivederci. What you wanted to communicate is lost in the past. Can you say what you need to say in those 3 seconds? Can you hook your readers so they want to read more? To write great headlines is a difficult art to master, even with the help of A/B testing. It begins with a very cool post at the New York Times Bits blog. I don’t want to give away too many details. There is a video with scientist explaining their software and image analysis technique, and showing diverse examples of uses for it. One example shows video of a sleeping newborn. With the software you can make visible the small movement in the surface of the baby’s face due to blood circulation, and measure his pulse — without touching him. Another example shows that no special camera is needed; they take a clip from a movie with a famous actor sleeping on bed, just as shown in theaters, then the software shows his blood circulating up and down. What was the headline of author Erik Olsen’s blog? I was so excited about the link shared by Aatish that I decided to share it too. Not to be outdone, I wrote my headline with even more words (a bad initial decision that ended with a bad headline). Ed Yong grabbed the amazing headline crafted by Robert Krulwich on his blog Krulwich wonders “MIT Invents A Machine That Can Look At Batman’s Face And See His Heart Beating” then added a WOWOWOW! at the beginning (meaning look guys this is awesome) and gave you the exact part of the video where you can look at Batman’s face and see his heart beating. 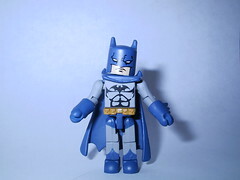 The picture is already showing you batman… If you can resist to click on the link it can only be that you have no pulse. Lesson learned. Next time I write a headline I will remember Liz Neely’s question, and the treatment that Robert Krulwich and Ed Yong gave to this piece. In my opinion Batman kicked other headline’s but, and I will try to write more Batman headlines in the future.